Let me start by saying brainstorming blog ideas is the easy part. The harder part is writing the actual post and then clicking the “publish” button. In December 2017, I set myself a goal of writing 52 blogs (one for each week) for my website the following year. To see if I could commit to a weekly writing schedule. Logically, I needed to come up with at least 26 blog topics to cover me until June 2018. 5 blog posts in and I’m already one blog post behind. I’m a little red-faced to say I fell off the wagon last week because of work deadlines. But I’m back this week, determined to catch up, so expect another blog post shortly. When I decided to write 52 blogs, I first let the idea marinate in my brain for a few days. I also thought about what areas I wanted to blog about and who I’d be speaking to in my blogs – fellow writers or potential clients. I decided to write on these topics: feature writing, copywriting, productivity and running a business. These were the core areas where I had something to share with readers based on personal experiences. When I sat down to generate blog ideas a few days later, I turned off all distractions; phone, social media and the Internet. Armed only with a pen and a fresh, clean page in my idea notepad, I started writing furiously as topics poured out of my brain. I eventually reached a point when I couldn’t come up with any more blog topics. As I re-read my list of topics, I found many generic blog ideas with a few sparkling in between that could be refined and turned into interesting blog posts. Out of 60 blog post ideas, at least half were rubbish and the other half needed refining. I’ve held on to not-so-great ideas so I can brainstorm different angles from them later. The next step, I believe is what determined whether my blogging goal would be a success or doomed to failure resting among the dregs of blogging enthusiasm and tired, neglected topics. I scheduled writing a blog post in my diary every Sunday. For the last 5 Sundays, I’d been writing and publishing a blog post religiously. Why Sunday and not Monday? Usually, my Sundays are unscheduled so I do have one or two hours to work without being disturbed. I prefer to allocate Mondays to income producing activities like sending out pitches to editors. Last weekend, I missed my morning ritual and so my post never got written. If not one of the topics on my list excite me into writing a blog, I scroll through social media or think about something interesting I’ve seen on TV. Could I turn it into a blog by putting a personal spin on it like this one? If a topic has been done to death – I try and flip it into a negative or opposite to make it sound more interesting. For example, how not to write a blog that puts readers to sleep. If I want to go off on a tangent, I give myself permission instead of churning out a ho-hum blog post that no one will read. Sometimes, a topic pops into my head when I’m reading something unrelated. I write it down quickly in the notes function on my phone or it gets lost forever. If you know the areas you want to blog about but are still stumped: use this website to help you think of fresh blog topics or look through Facebook group posts to read what people are talking about. Put that aimless social media scrolling to good use! I keep a running list of blog topics on Evernote or a notepad. So I’ll never run out of blogging inspiration! 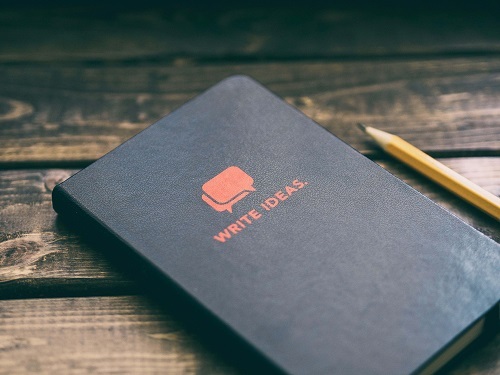 How do you think of blog content ideas for your business? Do you have a technique or process that works for you?